Stocks opened lower again on Wednesday, but cryptocurrencies aren’t seeing the same slump. Bitcoin was up as much as 8%, with most of its cryptocurrency peers also in the green. Stocks opened lower again on Wednesday, continuing a week that has been marked by drastic selloffs, but cryptocurrencies are getting a boost thanks to congressional testimony from two major US regulators on Tuesday. The total market value of global cryptocurrencies was up 25% since Tuesday, according to CoinMarketCap.com, to $US488.82 billion. 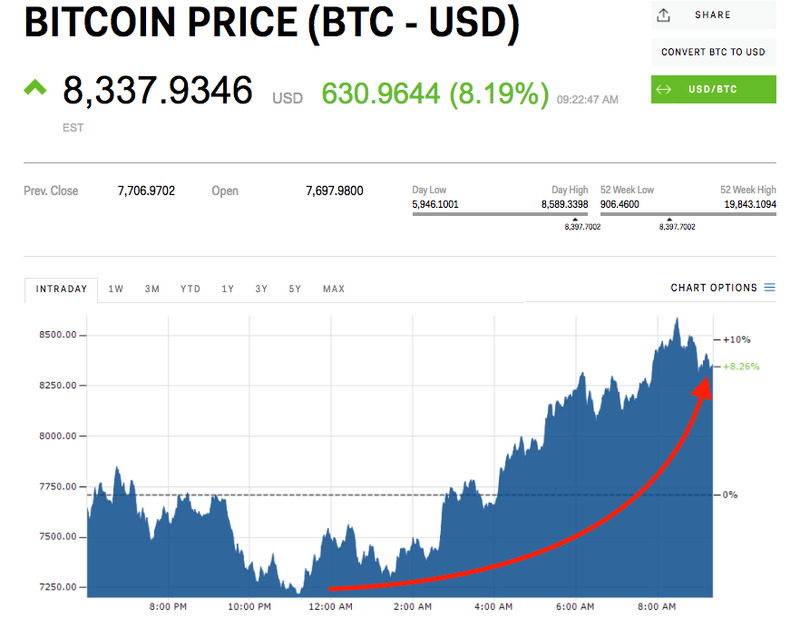 Bitcoin, which makes up about 35% of that total, was up 6% – or nearly $US2,000- to $US8,183, according to Markets Insider data. Ethereum and Ripple’s XRP, the second- and third-largest cryptocurrencies, were both up 3% at the time of writing. Bitcoin bottomed out below $US6,000 this week, and prices of all cryptocurrencies plunged, fuelled by fears of a cryptocurrency crackdown in India after the country’s finance minister said the government would not recognise crypto as a legitimate form of currency. That anxiety has mostly cooled thanks to an announcement from the country’s secretary of economic affairs saying the country will set up a panel to examine trading of crypto assets, and will report its findings next month. 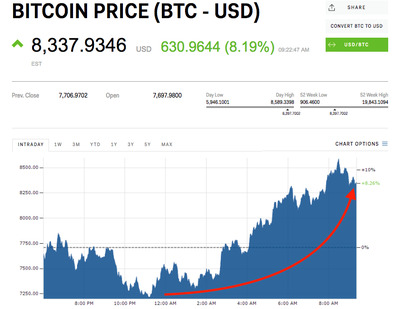 XRP’s gains come at the same time as its creating company and largest holder, Ripple, announced it had signed a large Chinese firm onto its xCurrent settlement product for international payments. So far, 2018 has been marked by wild price swings for all cryptocurrencies, often more than 10% in either direction in a matter of hours. In January alone, bitcoin traded as high as $US19,843, and as low as $US5,946. And when bitcoin moves, so too do all of the other cryptocurrencies. This is a scary sign, Goldman Sach’s head of research said on Monday.